An action game with RPG and CCG elements set in a fantasy world, developed by Thing Trunk, an independent Polish studio. Book of Demons for PC and XONE is an action game with RPG and CCG elements set in a fantasy world, developed by Thing Trunk, an independent Polish studio. Return 2 Games: Book of Demons is the first production from a planned series that is intended to pay homage to the best titles of the last decade of the 20th century. Therefore, in Book of Demons, there is no shortage of numerous references to the original Diablo, although its visual style is based on parody and a large dose of dark humor. The production’s plot is another variation of the fight between good and evil and a chosen one who rescues the world from annihilation — we set out to fight hordes of demons, constantly wading through to an archdemon who is hidden in the deepest level of hell. The story openly mocks Blizzard’s classic and similar hack ‘n’ slash productions. The universe is set in a book, and characters look like paper cut-outs. 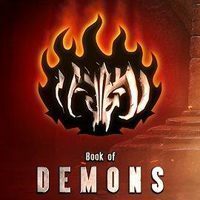 Book of Demons for PC and XONE is an action RPG in which fighting demonic hordes is the centerpiece. The monsters inhabit vast catacombs underneath the city. The player traverses three-dimensional locations shown from an isometric perspective, facing countless enemies. Between quests, we travel to the city which is our base of operations. Therein, we can also talk to non-player characters and trade equipment. Thanks to the procedurally generated world, each visit to the dungeons is a completely new experience and its length as well as difficulty level is determined by the player. While playing, we gather and collect various cards. Each of those corresponds to different skills; before every mission, we can compose a deck with which our character will wreak havoc in demons’ ranks. In dungeons, there are over 70 kinds of enemies that have unique attacks and present various challenge. The key to success in fighting them is to properly compose our deck of skill cards, so it is important to be prepared for every eventuality. Referencing classical RPGs, Book of Demons gives three character classes at our disposal: a warrior, a thief, and a mage. The class determines our equipment so we cannot equip our hero with anything we find. Warrior can uses all sorts of melee weapons and armor. Thief specializes in distance attacks and applying special effects to our enemies, for example, a poison. Mage, in turn, can’t wear armor but is proficient in arcane arts. Return 2 Games: Book of Demons for PC and XONE presents unique graphics that make the world look as if it’s constructed from cut-outs. In accordance with such a style, we won’t witness any spectacular animations, although it does not make the title any less enjoyable.